​​The Mr. T Experience, known to fans as "MTX", has been a punk pop thorn in the side of the San Francisco Bay Area music scene for thirty years now. Typically regarded as among the founders of "East Bay Pop Punk" and led by singer-songwriter Dr. Frank (dubbed "the Cole Porter of punk" by one or two writers over the years) the band has released around a dozen albums and eps, on Green Day launchpad Lookout Records throughout its heyday the 90s. Under his real name, Dr. Frank (Portman) has also published three young adult novels, including the bestselling cult favorite King Dork and its recent sequel King Dork Approximately. 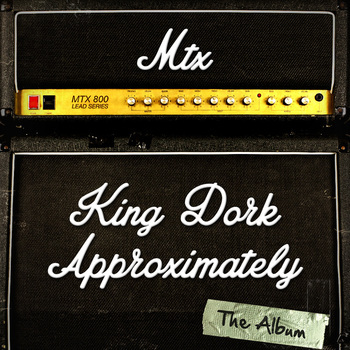 Now with the paperback release of the latest book comes the eleventh full length studio album from MTX, featuring songs from the books, titled King Dork Approximately the Album. The album will initially be an exclusive free download with with purchase of the book, followed by general digital release in January, and a vinyl edition with extras in the Spring. The schedule is: 9/20, digital single release of the song "Cinthya (with a Y)" w/video; 10/4: digital single release of the song "High School Is the Penalty for Transgressions Yet to Be Specified" with video along with the release of the book and album. Limited, selected tour dates to follow.